This short guide presents approaches to monitoring and assessing the social impacts of affordable housing, which may be relevant for organizations that seek to maintain or increase the availability of affordable housing stock, provide outreach to connect people with services and housing, increase the affordability of housing (e.g. rent subsidies, mortgages) and that support people to maintain housing and integrate housing with other services. Rather than present a list of indicators, we present different methodologies for assessing impact that can be applied to different types of projects (and budgets!). We also present published research that sheds some light on how affordable housing may impact people and communities. The following table describes potential questions that measurement could address in these three areas. Not all questions relate to all projects. What does the project seek to do? What part of the housing continuum does it target? Who does it specifically target? What is the quality of the housing (size of units, age, upkeep, amenities, location)? Does it fit in well with the community and existing amenities? Does it include features that will enhance the community and its amenities? How many individuals/families are directly impacted (over life of project and/or beyond)? How is the quality of life of these individuals/families impacted? Is the vitality of the neighbourhood enhanced? How are property values impacted? How does it contribute to the housing continuum? What is the quality of the housing? Does it include features that will it enhance the community and its amenities? Research suggests that the location of social housing is as crucial as the design and operation of the facility itself. Social housing units that are located in neighbourhoods with easy access to community amenities such as recreation, shopping and transit, facilitate more community involvement and more physical exercise for the families in these units, with resulting health benefits. Housing and neighbourhood quality has also been shown to have a strong influence on the stability and health care coast of people living with mental illness. A British study found that people living in newer and properly maintained buildings had lower mental health care costs and residential instability. Buildings with a richer set of amenity features, neighborhoods with no outward signs of physical deterioration, and neighborhoods with newer housing stock were also associated with reduced mental health care cost. Frameworks and processes that identify and measure development attributes as part of municipal planning and zoning practices. Aspects of housing quality that are included in these tools include: location, community amenities and fit, site design, units (size, layout, noise, light, services, accessibility), green building, property management, input & leadership. When investigating impact it is often useful to lay out a logic model, the chain of outcomes that are influenced by the project (sometimes known as an Impact Map or a Theory of Change). 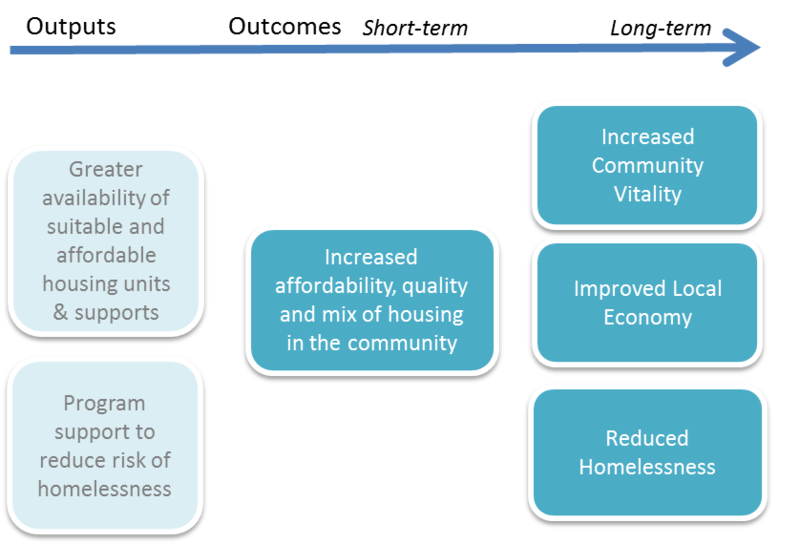 A generic, simplified model is shown below for how a project in affordable housing could impact individuals and families. While activities and inputs will vary for different projects and are not shown here, the outcomes for affordable housing projects would stem from an increase in the availability of suitable and affordable housing units (and services) and the ability of households to maintain decent housing. This ultimately leads to improvements in housing stability (a household maintains or improves its housing situation) and long term outcomes such as improved standard of living, an increased ability to pursue educational and employment opportunities and increased well-being and health. This is a simplified model, and the design of your program/project, as well as many external factors, would influence the degree to which any one of these outcomes occurs. Nevertheless this can be useful framework to identify indicators that can be tracked to understand impact and to evaluate the project. Potential indicators, tools and research are presented and discussed below for different sections of this model. Showing that households are accessing housing and services, as well as maintaining or improving their housing situation can be fairly straight forward to measure. 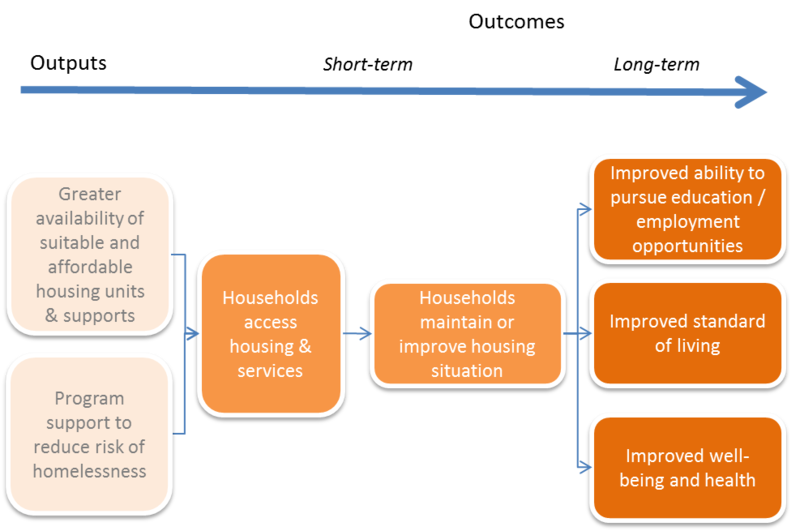 One method for measuring whether households maintain or improve their housing situation is to relate progress to a housing continuum. While there are many subtle variations in continuums, here is one that is used by Canadian Mortgage and Housing Corporation. There is evidence that transitional housing is successful in improving housing status: a large-scale literature review of more than 75 transitional housing programs (supplemented by 6 case studies) found that from 66 per cent to 90 per cent of the residents moved to permanent housing or achieved other forms of success. This study could only comment on the short-term success of these programs; long-term effects of transitional housing and the impacts of various types of case management are unknown. In general long-term impacts are much more challenging to study, particularly if the people supported by these programs are transient and challenging to contact, and when their path involves multiple organizations. Case studies and narrative may be a useful tool for showing this impact. Long term outcomes relate to changes in standard of living, access to employment and education opportunities, and improvement to well-being and health. Standard of living refers to a household’s level of wealth, comfort, material goods and available necessities. Having decent housing is clearly directly related to standard of living. Also, by providing affordable housing, household income that would have been spent on housing is now directed to other uses, including savings and investment. This contributes to improvements to a household’s standard of living, along with potential benefits from improved housing design and neighbourhood amenities. Measures of standard of living include both direct income data and asking families directly about whether they can afford certain necessities. Housing stability can contribute to greater educational and employment opportunities. Family educational opportunities and outcomes in particular have been related to housing. A CMHC commissioned literature review of outcomes from affordable housing looked at more than 100 studies found that the stability of housing has been shown to give rise to improvements in educational performance. Some studies also found positive associations with home ownership although this was not conclusive in all cases, especially for lower-income owner households. · Location of housing relative to job opportunities. · Linkage between housing program and employment/skills development programs. · Availability and accessibility of means of transportation. Well-being and health are high-level outcomes that have been measured in different ways. Typically well-being refers to changes health, emotional well-being, resilience, meaning and connection in life. These outcomes can be measured by surveying residents and/or program. There are many personal well-being assessment tools that have been developed to understand changes in personal and family well-being. Homeless Link has an excellent guide to navigate relevance of outcomes and measurement tools: Inspiring Impact Review of Outcomes Tools for the Homelessness Sector. A study based on 85 interviews in British Columbia found for a majority of families in housing need, a move into social housing can have a positive impact on health, education and social wellbeing outcomes. A longitudinal study found that safe, secure, and affordable housing is a vital factor for recovery from mental health issues. Safe, affordable, and accessible housing is a key determinant of health, particularly for seniors, and is imperative in promoting healthy and successful aging. As in the previous section on the impact on families and individuals, it is helpful to address questions about broader community impact by describing a simplified logic model. The table on the following page shows examples of indicators that can be used to assess these outcomes. These are drawn from work by Metro Vancouver in its Affordable Housing Strategy (2007) and by the Federation of Canadian Municipalities in its report on the Trends & Issues in Affordable Housing & Homelessness. Longer term outcomes of affordable housing often focus on community vitality, the local economy and the reduction of homelessness. While definitions vary, community vitality can be understood as having (1)the capacity in a community to plan, make decisions, and act together, and (2) that the community realizes positive social, economic, and environmental outcomes. Community Vitality can also be termed Community Quality of Life or Community Sustainability. The Federation of Canadian Municipalities established the Quality of Life Reporting System (QOLRS) in order to measure, compare and monitor the quality of life in 20 of Canada’s urban municipalities. Genuine Progress Indicators - A broad-based index of sustainable development and well-being that has been developed as an alternative to Gross Domestic Product. Vital Signs - Annual community check-up conducted by community foundations across Canada that measures the vitality of our cities . Contrary to opinions that subsidized housing will always lead to neighborhood decline and change, research suggests that subsidized housing was almost as often associated with positive impacts. For example, a study looking at the experience of New York City suggests that well-designed, well-managed projects built on distressed sites played an important role in helping to revitalize a community. Both theory and existing evidence suggest that the neighborhood impacts of subsidized, rental housing will differ depending on where it is built, the scale of the development, the characteristics of its tenants, and the nature of ownership and management. A vibrant local economy is part of a vibrant economy. This element is expanded on in more detail because it has been subject to considerable inquiry particularly in the area of whether affordable housing projects influence property values, and how it may influence economic activity. Social housing projects have been perceived as negatively influencing neighbouring property values and sales. Research evidence suggests otherwise. A 1996 study by the Housing Ministry in BC looked at the impacts of seven social housing projects on neighbouring property values. The study demonstrated that social housing projects have not had a negative impact on the sale prices of nearby homes based on a comparison with a control area. A literature review by CARMHA (Centre for Applied Research in Mental Health and Addiction) at SFU indicates that property values have not declined with supportive housing. Positive local economic outcomes of affordable housing stem from construction jobs and increased spending both during construction and after the homes are occupied. When housing is more affordable, families have more income to spend on local goods and services (i.e. increases in consumer spending). Investing in affordable homes also increases revenues for regions and municipalities. Some of the most significant sources of revenue during the construction or rehabilitation phase are sales taxes on building materials, corporate taxes on builders’ profits, income taxes on construction workers, and fees for zoning, inspections, and the like. It is also possible to estimate the economic impacts associated with an activity. This type of analysis can be specialized to undertake; many consultants work in this area. Studies typically model the relationships between spending in the community and economic activity (usually described in terms of jobs and income generated). New Economics Foundation developed a tool called Plugging the Leaks specifically for community development. The data typically include individuals living on the street and in shelters over a specific period. Note: comparison between regions is challenging because of an absence of agreed definitions, across time and place, of what constitutes homelessness. Canada Mortgage and Housing Corporation (CMHC), “Affordable Housing for Families: Assessing the Outcomes” CMHC research highlight, Socio-economic Series 10-007, July 2010. Canada Mortgage and Housing Corporation (CMHC), Transitional Housing: Objectives, Indicators of Success and Outcomes, Socio-economic Series 04-017 February 2004. Canada Mortgage and Housing Corporation (CMHC), Overview of the Current State of Knowledge on Societal Outcomes of Housing , Socio-economic Series 10-001, January 2010, p. 3. Ingrid Gould Ellen “Spillovers and Subsidized Housing: The Impact of Subsidized Rental Housing on Neighborhoods,” Joint Center for Housing Studies, Harvard University, March 2007. Malcolm Williams,” Can we measure homelessness? A critical evaluation of ‘Capture–Recapture’” Methodological Innovations Online, Vol 5,2 (2010) 49-59.